Last November, three of us had one of those safari’s that don’t happen very often. Where we saw more lion, and leopard than we saw elephant! 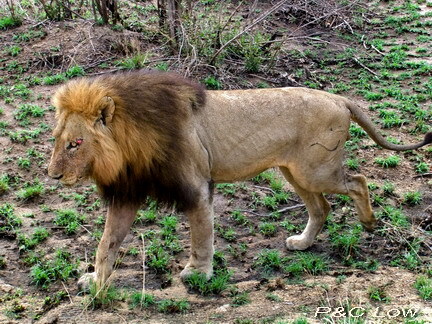 Multiple sightings of hyaena and male giraffe fighting were just some of the other highlights. 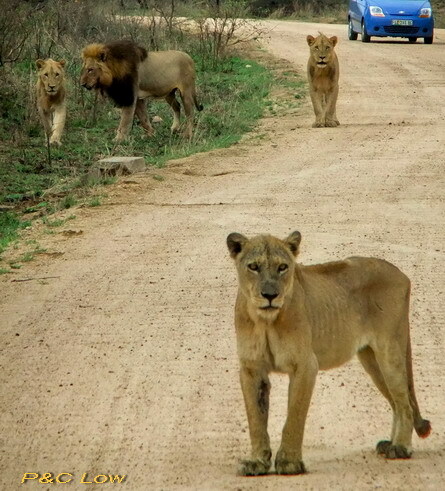 However, I think we all agreed that the “road full of lions” was the very large cherry on the top! It was two hours in to the early morning game drive south of Skukuza, and we had already had awesome, close-up sightings of leopard on a kill, hyaena, elephant and zebra, an excellent drive in other words…….. 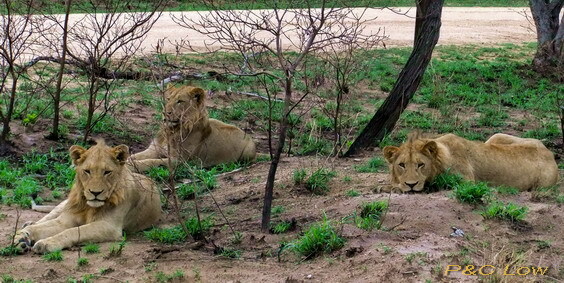 The three young males were a little more alert and kept a sleepy eye open on us. A flicker of movement on the right, and we saw a warthog casually walking across the open ground behind the males. A whiff of that unmistakable cat smell, and the warthog was suddenly trotting, mistake, as this really caught the attention of these 3 youngsters. And the next moment they were off! 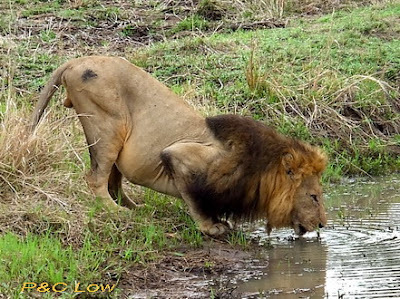 Needless to say warthog got away, he was really too far off for the boys to catch him. This little bit of action did succeed in waking up the rest of the pride, and after a few lazy stretches they all rose and started walking down the road past and behind us. 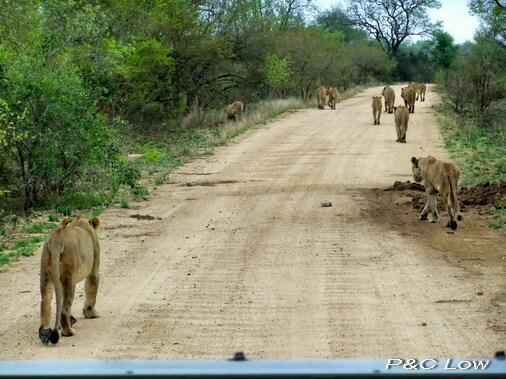 We quickly turned around but as the lions were “hogging” the road we couldn’t really get past them for a while, but follow we did. 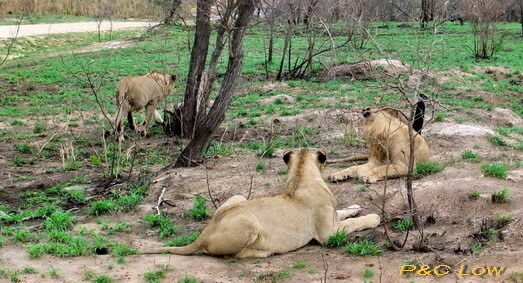 This all changed when one of the leading lionesses suddenly went into “watch” mode just behind a small bush. 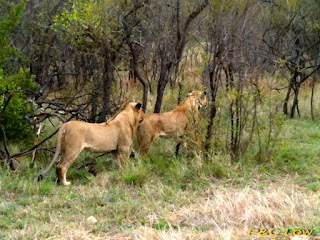 We couldn’t see what she had seen but all the younger lions were obviously alert to her body language and peeled off, right and left into the thicker bush at the sides of the road. We waited for quite a while, and the lions at the back of the “pack” decided to stop and relax as well – they were obviously leaving any possible hunt up to the more energetic (or maybe just hungrier?) 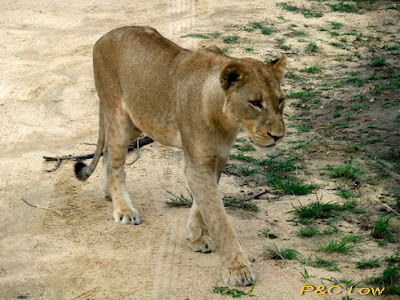 members of the pride. Another 15 minutes of focused attention, and the lioness relaxed, the intended prey had perhaps moved off too far for them to successfully hunt. 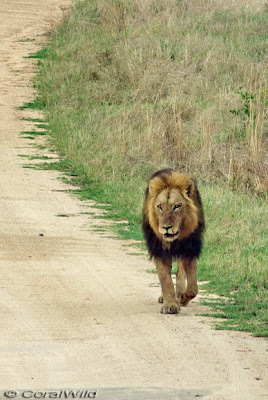 The pride, dispersed now on both sides of the road carried on into the thicker bush, leaving the large, pride male to walk majestically down the road towards us. He took a quick drink at the small pool next to us and then, he too, disappeared after the rest of the lions. 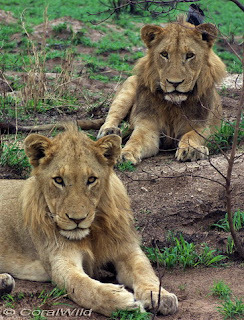 In total we had spent almost a full hour with this pride of eleven lions, and what a glimpse into their lives they had given us! 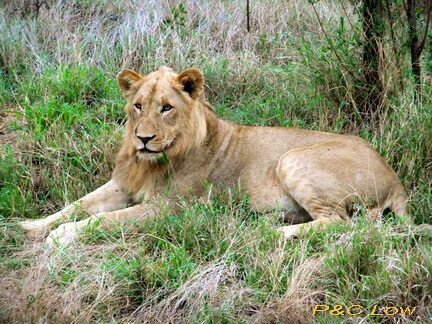 My thanks go to Philip and Chelcy who not only shared this experience with me but also provided most of the great photos for this posting. 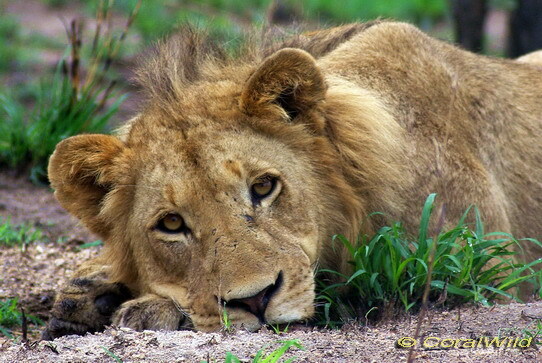 I am really looking forward to my first ever visit to Etosha this November - can't wait!